Michelle Cordero - Come with me to Mexico in 2017! The retreat center is simply magical. ​You are surrounded by nature at all times: unobstructed ocean views, majestic blue skies, green plants, ocean breezes, sunshine and tropical air. The sound of the waves lulls you to sleep. I dreamt of storms and waterfalls. Practicing yoga every day, twice a day on the newly constructed yoga platform​ open to the elements facing the vast beachfront​ ​lends toward deeper breathing, greater calm and a sense of oneness with nature. I had to use all of my vocal training in order to be heard over the sound of the waves. The food is impeccable: fresh eggs​ and ​salads from the onsite permaculture farm,​ fish right off the boat,​ aqua ​f​resca in new tempting natural flavor daily, fresh tortillas and avocado with every meal. It’s the definition of “fresh mex”​, and​ ​yo​u eat ​o​ceanside in the open air dining area. Our last night we dined on Pozole, a popular local dish, they even make vegetarian Pozole! Unlimited coconuts to quench your thirst, attention to detail and friendliness to the environment ​even down to details​ like c​loth towels instead of paper, glass straws instead of plastic​ – ​it just​ ​won me over. 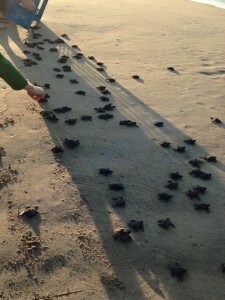 And baby turtles! The neighboring turtle sanctuary brings baby sea turtles over when they hatch, so we had three opportunities to guard these being s safely into their new ocean home. Truly an unforgettable experience. Click here to see more photos. If you seek to leave your cares behind and be completely pampered in a beautiful natural setting, this is the trip for you. 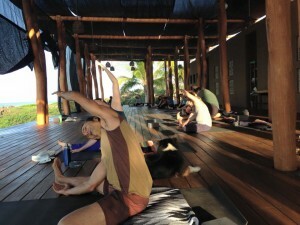 We will dive deep into a nourishing, fun and sometimes challenging yoga practice twice daily. Your hardest choice will be whether or not to leave your chaise lounge for an optional excursion. Most of our group decided to stay put because frankly, it doesn’t get much better than this. 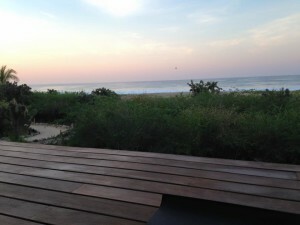 Every casita faces the ocean and some with sliding walls that can expose or cover you as you wish. We swam in the ocean every day, playing in the waves, riding the boogie boards provided. It was absolute bliss, and I cannot wait to go back. For more details and to sign up, click here.